Read the posts of the Sailors on the "Where To Send" page. Jot down a few names and what they want. Also try clicking on the highlighted words in their 'updates'. Return here and find the items from our sponsors. All the sponsors on this page offer discounts or some other benefit to AnySailor.com supporters. This is about SUPPORT, not just STUFF! A LETTER, from you, your children, the kids at church or school, is THE BEST THING to send. A show of personal support is far better than spending a bunch of money that you don't have. The letter in the box IS more important than the box itself. When the temperature drops, these will keep their feet warm. Available in high and low models, and two different colors. Desert sand for the Army, and Mohave for the Marines. All pairs only $79.99. A great portable snack that not only provides real nutrition but also tastes good. Some of the most durable socks ever made. We work with a guy who has been wearing the same three pairs pretty much every day for the past 2 years and they still look and feel like they just came out of the package. These make a world of difference in the level of comfort when carrying 70+ lbs of gear and are by far one of our most sought after items. It's really impossible to overstate the need to keep a weapon clean and fully functional in a tactical environment and this tool allows for much quicker and easier maintenance than standard cleaning methods. A great pair of eyepro. These are comfortable, nearly indestructible, and offer lens options for all light conditions. The board of JDS Computer Donations is pleased to be part of the AnySoldier® support team. JDS computers is a 501(C)(3) organization located in southeastern Michigan. We are a group of volunteers that takes donations of used corporate computer equipment and repairs/rebuilds/refurbishes and provides the equipment to schools and other organizations. In Jan of 2005 we started rebuilding laptops and providing them to deployed American troops. We have been able to deploy hundreds laptops in internet cafes for thousands American troops. No kidding! A really good excuse to get rid of those things (don't buy new ones, collect them from your house and ask your friends)!! Send some in every package to ALL units as they are really easy for the Sailors to carry with them and give to the local kids who love them. These are better then small plastic toys which will break easily and are not as easy to carry in a pack. There is NO more effective ambassador for our country than a Sailor helping the local folks. This is done far more often then the press shows, and quite probably the most important thing a Sailor will ever do. This picture is from CWO3 Edward Jimenez's unit in Afghanistan (2004). 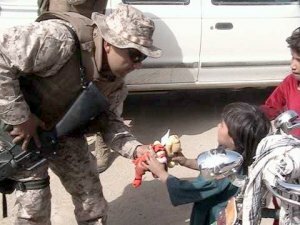 You folks sent the toys this Marine is handing to the child. Illegal copies of anything. Period. Don't know if it is legal or not? DON'T send it. Home-cooked anything. See our FAQ. Note: Due to concerns for the health and safety of the Sailors, and as much as we don't want to say this, please do not send home-cooked anything to Sailors other then to your relatives or people who know you. Factory packaged only. Sorry. The Sailors are told to throw away anything that is not in a factory package. Especially during the holidays. Send SMALL boxes (say under 10 pounds) and no more than 3 to any single address in the same day. Don't be part of the log jam, be part of the solution. PLEASE read this. If you use this site and send anything prohibited or illegal to any of our Sailors, you will be hunted down, caught and prosecuted! I can tell you for a fact that the F.B.I. is and will continue to investigate any and all violations. The Sailors and Any Soldier Inc. are fully cooperating in this effort. Each Sailor's page has "restrictions to this address: Here (4)". Click on the "Here" and it tells you what you can't send. If you aren't sure about something, DON'T SEND IT! Please, do NOT be afraid to send stuff. Easy test: Would you send (whatever) to your mother? "As you might know, on occasion the Iraqi's have no problem supplying movie DVD's at a fraction of the cost back home. What you are not aware of is the fact that those movies are stolen off the bases and sold back to the soldiers. I recommend that when you supply that information to those who send packages and to the soldiers/Marines whom apply for items to be sent in, that they mark the movies to prevent unscrupulous individuals from benefiting from the unwary." 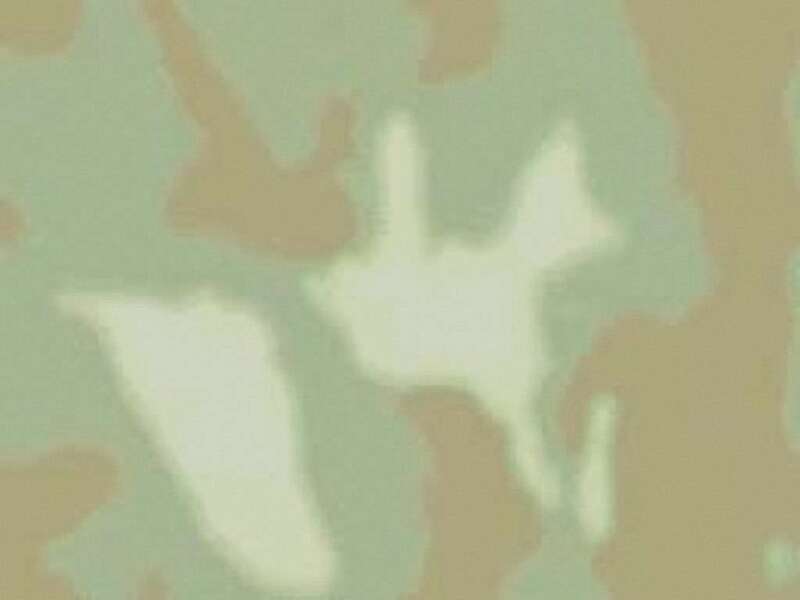 Colonel, USMC. Remember the many women Sailors there! If your package is intended for a woman, be sure to address the package, "Attn: Any Female Sailor". T-Shirts: Don't send the wrong type!